It’s gotten to that lovely time in our lives where all our friends are busy joining the parental club. The newest member, is a charming little boy, Hugo (gorgeous name right?). 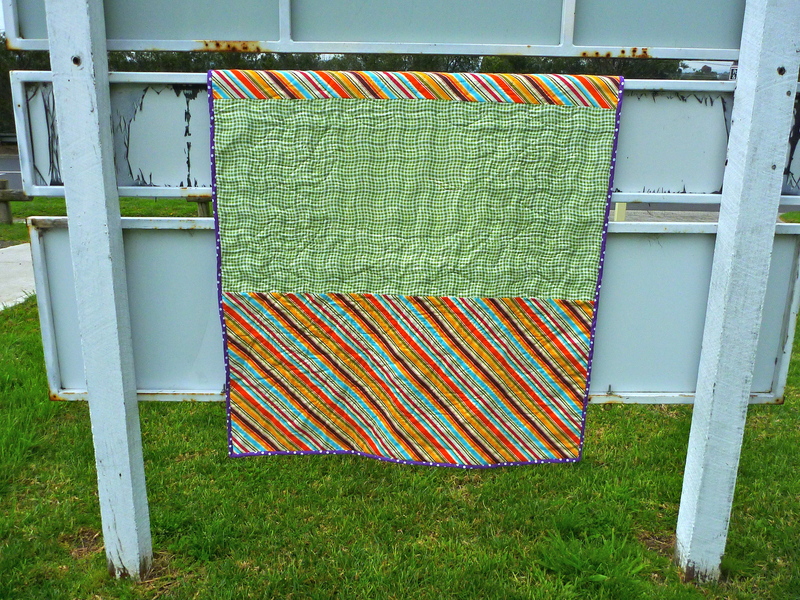 This quilt was assembled from a gender neutral jelly roll, as the gender of the bub was unknown, and also to have something nice and bright for bub to roll around and look at. 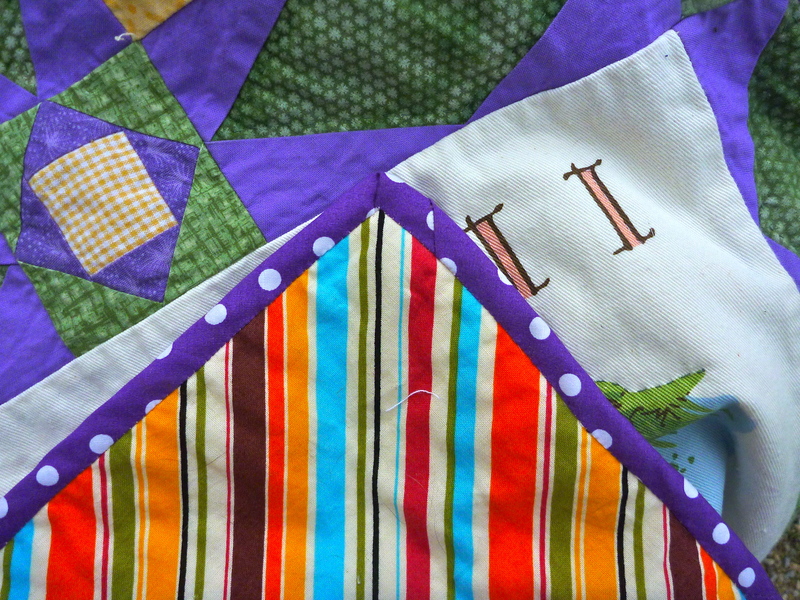 The quilting was done by machine, with a variegated thread in straight lines. 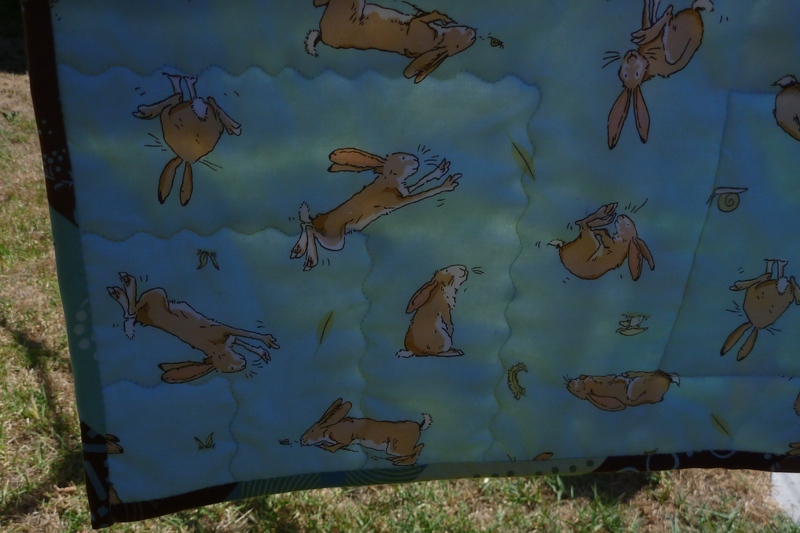 This way it’s easily machine washable (key feature of baby quilts) and still nice and soft. 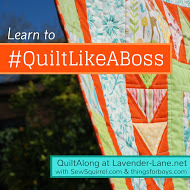 I find sometimes heavy machine quilting creates a very stiff quilt, which isn’t ideal for maximum snuggle factor. 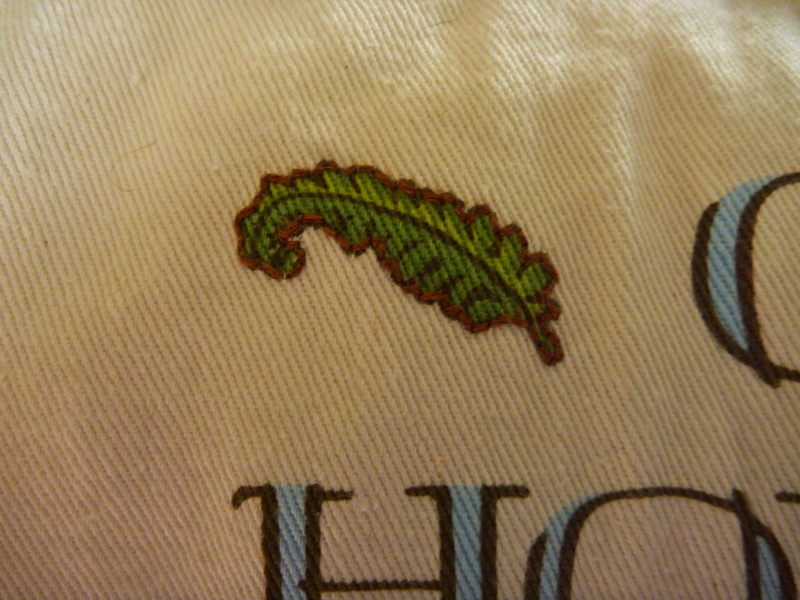 The backing is from my stash!!!! The stashbusting challenge has been going slowly, but this was one of my prouder moments finding a use for this fabric. 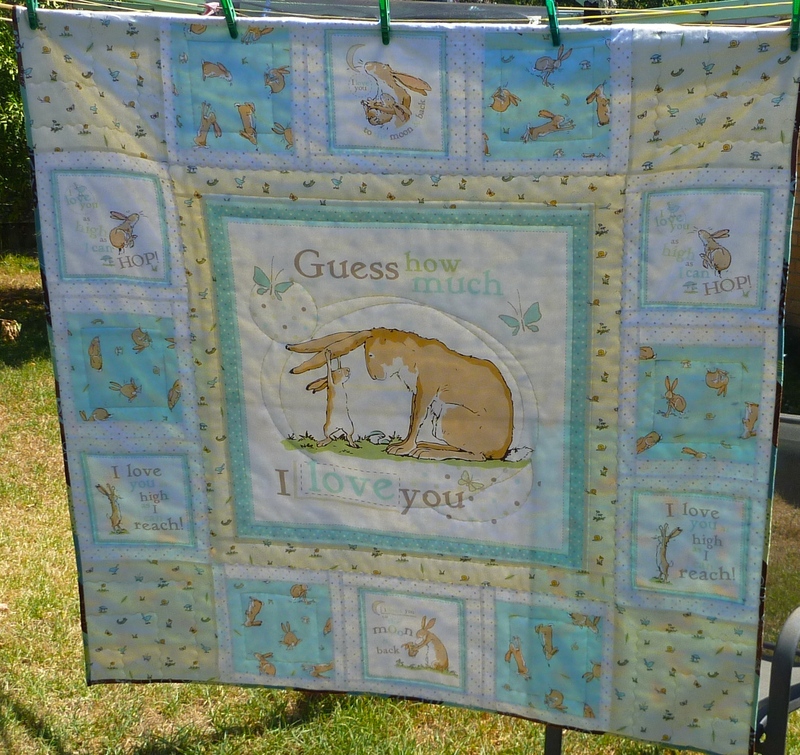 It’s been in the stash for at least 3 years, and it was just perfect for the quilt top. Now time to wrap it up, and exchange the gift for cuddles! One finished baby quilt! 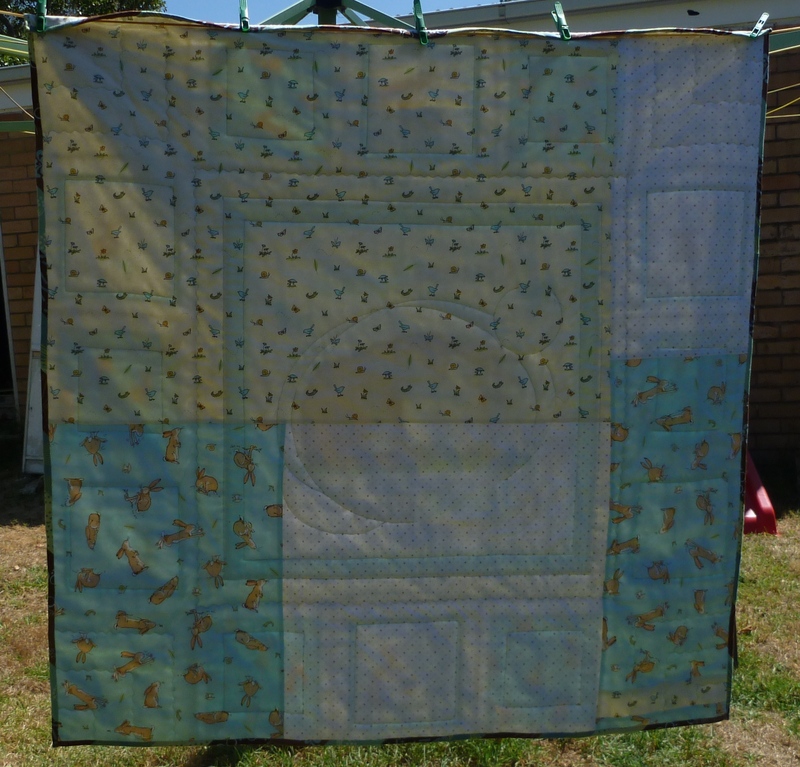 This star of the sea quilt surely was a labour of love, although significantly less than the lovely babys mama underwent. 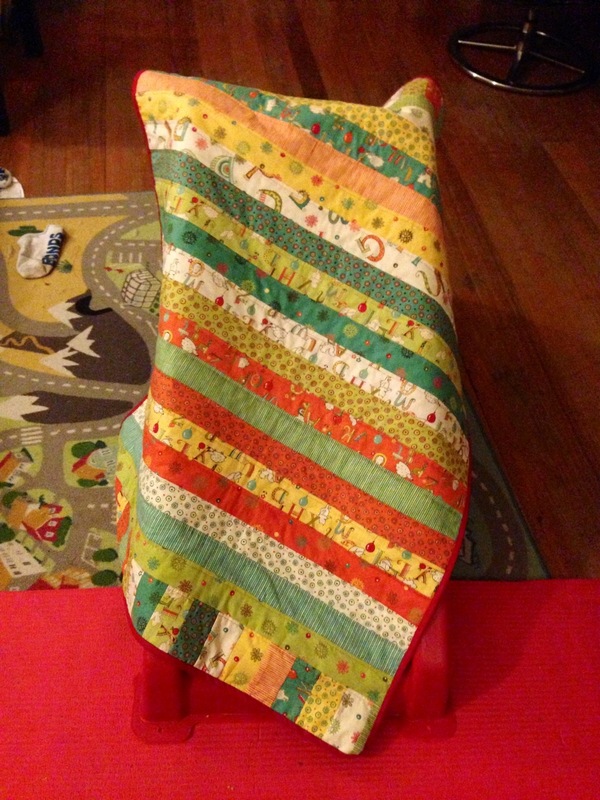 This quilt was for the little bubba of my dear friends Kate and Phil, who I’ve known for years. When I first moved out of home I moved in with Kate (a stranger) and another friend. Two years later we were still living together and Kate’s drunken uni buddy moved in as well (after living on our couch for a good year). Fast forward many boxes of lager to 2010, and I was so fortunate to be their bridesmaid at their wedding. 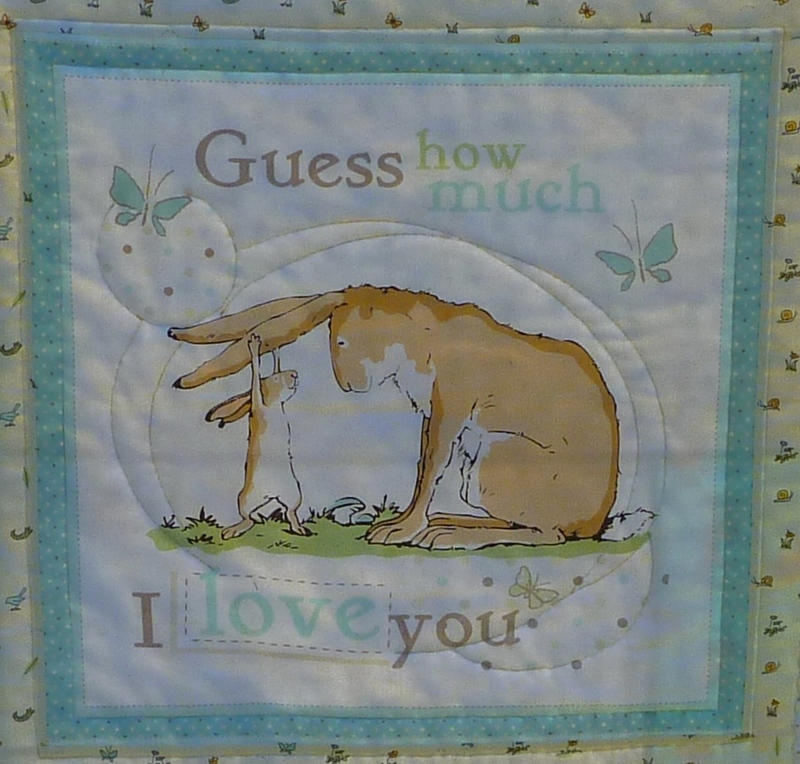 So here is I think my favourite and most special quilt, for their baby. 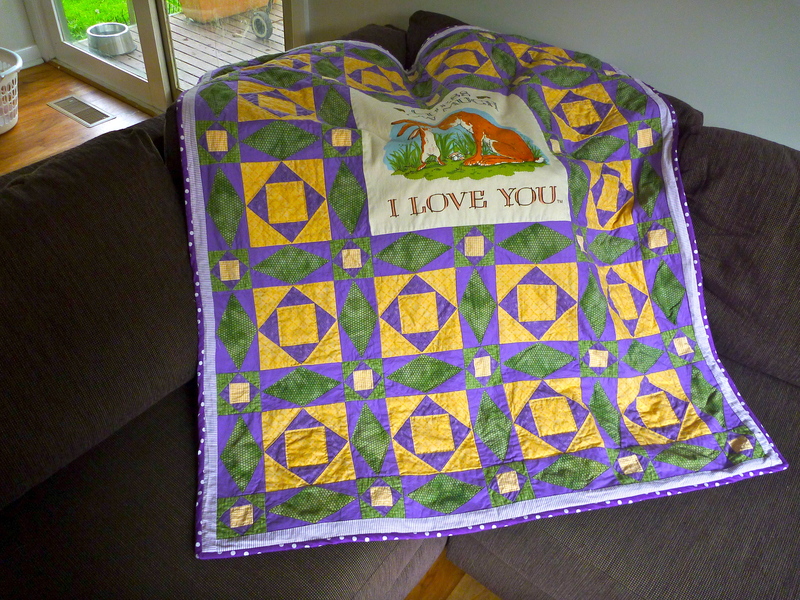 This quilt has some history, and I actually started making it in 2005 when we were still living together in drunken uni revelry. The panel was hunted down and is from eBay, from a lady on eBay uk. It’s from the childhood book “guess how much I love you” by Sam Brady. If you haven’t read this book, it tells the tale of little nutbrown hare trying to explain to his father just how much he loves him. It’s one of my favourite children’s books. This quilt has been slowly worked on over the years, getting it closer to completion, but each time my husband would suggest someone to give it to, it didn’t feel right. Not until this little girl. Do you ever get that feeling? 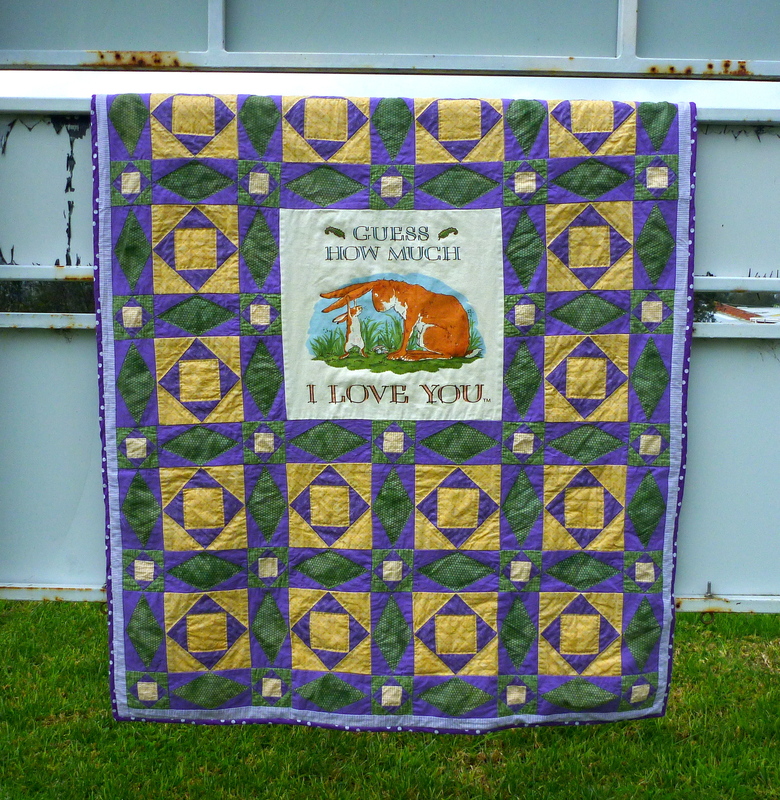 The design is star of the sea which was inspired from an edition of down under quilts. The real tragedy of this quilt is its the third I ever started, and I tried foundation piecing- and made some terrible noob mistakes. The foundation blocks are made from iron on interfacing. 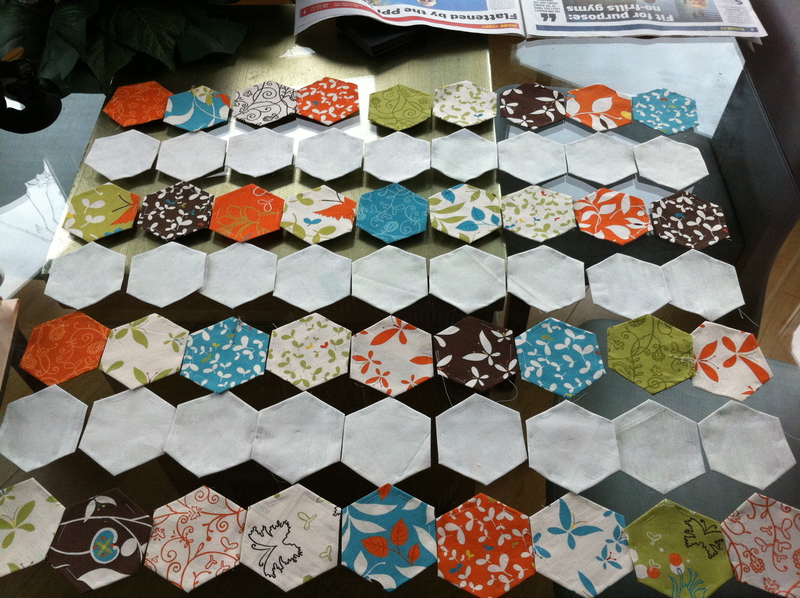 I had to manually cut out the interfacing on EVERY BLOCK after the quilt was assembled. I didn’t prewash the fabric. I wasn’t careful enough and some corners didn’t meet. The back is bright and still gender neutral, but broken up with the panel in the middle. 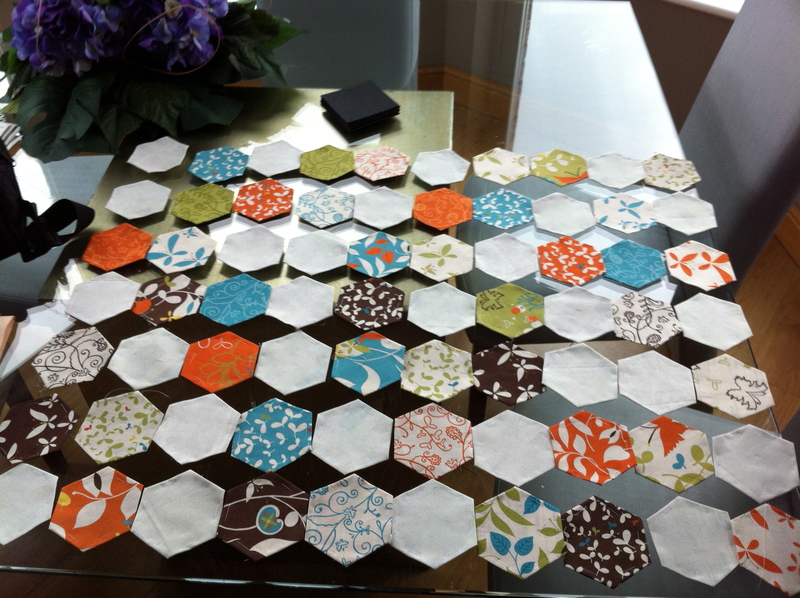 All the quilt is hand quilted in the diamonds and big squares with different coloured threads. 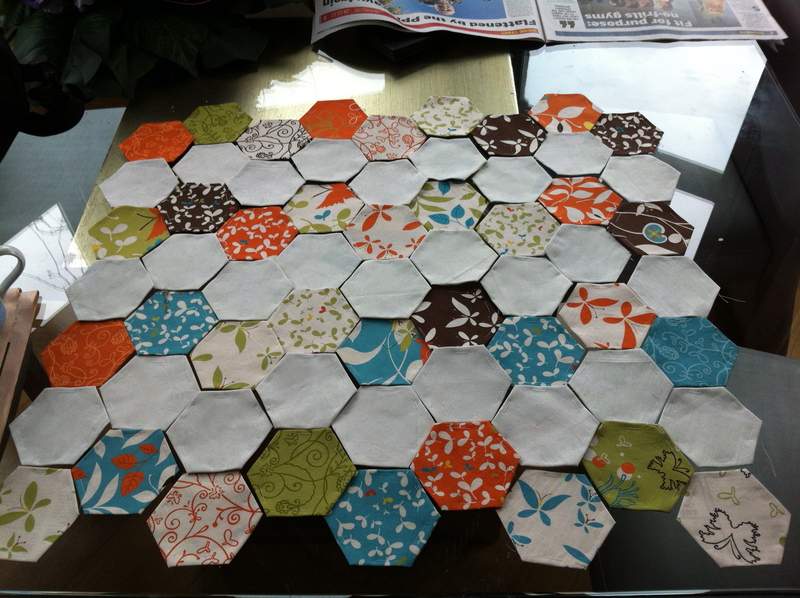 Now, if you’re thinking “wow, hand quilted- that must have taken AGES…” it did not take as long as cutting out interfacing. 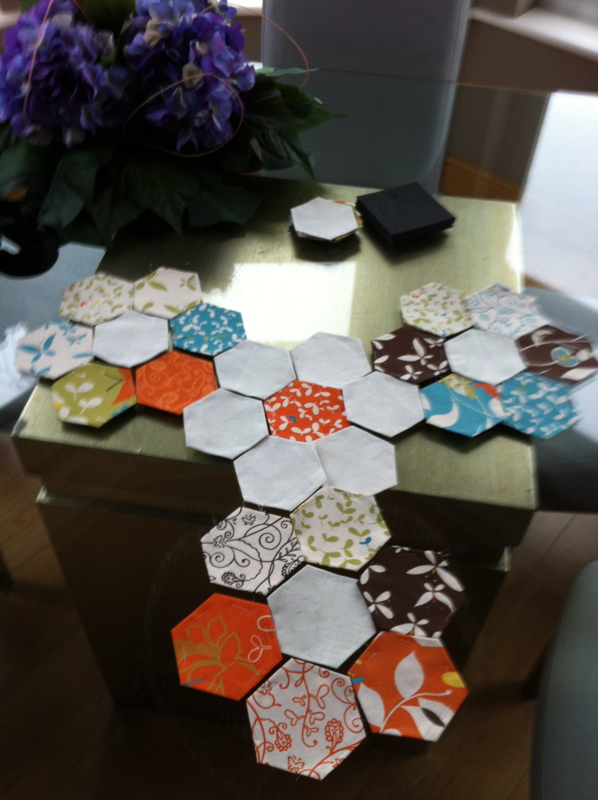 So if you want to try paper piecing, use this lovely tutorial, I wish I had!